The third book in the four-level Communication Spotlight series. The goal of the Communication Spotlight books is simple—to help students immediately improve their ability to communicate in situations where they have an incomplete understanding of what is being said. The focus of the speaking activities is to help students notice and practice different strategies they can use to cope in such situations. In addition to pointing out such strategies, the each book gives lots and lots of pair and group work to practice each strategy being looked at and to help with overall fluency. The focus of the listening activities is to help students notice how English changes in connected speech and to help students hear language they already know but now cannot recognize. In other words, aspects of speaking and of listening that can be immediately applied. 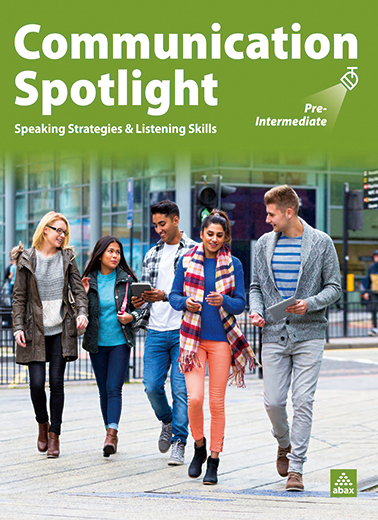 Spotlight on Speaking: focuses on the strategies of speaking—the strategies that work to give students control in communicative situations, to confirm or clarify what they're saying and what they're hearing, to show interest in and to maintain and develop conversations, to help with fluency and to compensate for a lack of language. Knowing and using strategies can give immediate benefit and is highly motivating. Spotlight on Listening: shows students how English is actually spoken, helps students move beyond classroom English to the English of the real world. For more on this go here. Spotlight on Memory: has students focus on form from hearing alone, stretching short term memory—vital for listening comprehension. For more on this, go here. Communication Spotlight: Giving students control over English! • For single semester courses, split versions of the first edition of this book are still available. Please inquire directly about either of these editions of Spotlight.